Little Nightmares scares us by turning up the dials on all five of our senses before feeding us to the monsters. There is an inevitability of death that gives your pessimism strength. If you’re the kind of person, like me, who doesn't believe in an afterlife or inherent human significance, then the topography of time begins to feel less like a path and more like a pit. There’s a whole way of living your life where all you do is fall. Euclidean, an atmospheric horror game best experienced through the Oculus Rift VR headset, embodies the cosmic futility of the falling lifestyle. Mostly it achieves this through its central gameplay conceit: in Euclidean progress is made as you fall through abstract Lovecrafian dreamscapes. You can see your feet dangling below you as you plummet and sink, slowly maneuvering to avoid the geometric demons that threaten to obliterate you on contact. 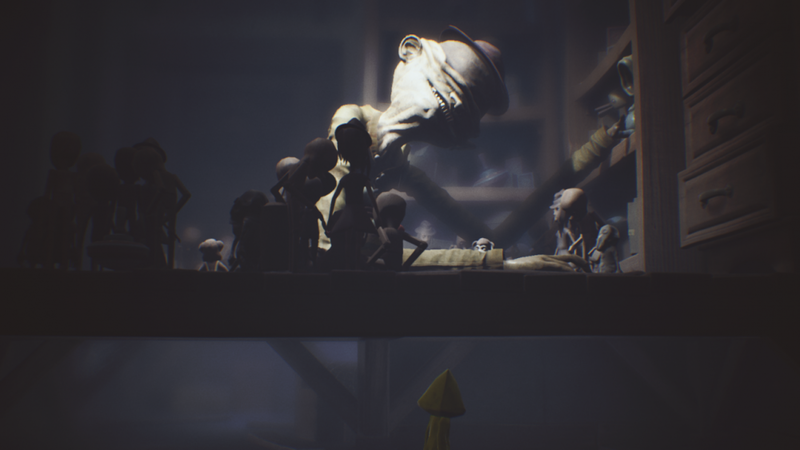 The game's narrative also unfolds vertically. You begin atop a mountain. A telescope is nearby, it is nighttime and you have just finished painting a neighbouring peak, overtop of which hangs a full moon. If you stare into the face of the bright orbiting rock, it appears to get closer until reality dissolves around you and you begin to move downward. As you dodge the objects in your path, a disembodied voice taunts you. Its language is prohibitive and antagonistic. It tells you that you ought not to have come to this strange place and asks you the sort of questions that would drive a Miskatonic scholar straight to the asylum. As you fall through various strata of abyss, it becomes apparent that the end of the game will not be one that you can return from whole. Euclidean is a game of annihilation. You dodge threats and persevere through significantly difficult scenarios only to find death in the end. There is nothing beyond what lies at the bottom of your journey. Euclidean’s greatest achievement is its ending. Bathed in white light, you are made to feel rewarded for your masterful navigation of the demi-void, presented with the images traditionally associated with heaven and spiritual enlightenment (think the ending of Journey). But of course, there are no happy endings in a universe not made for us. No, all of your semi-purposeful descent was into the gaping maw of something you can’t understand, and which might not even be hungry, but nonetheless, will accept you in its tentacular embrace.